War is in the air. Two feuding nations after a decade of a very fragile truce assemble their armies: Her Majesty Susanna from Thargaton with troops in black uniforms to the west and Cardinal Nicodemus from Vesani with white-robed religious fanatics to the east. Both leaders try to secure the most strategic parts of forty-kilometer-long strip of no man's land. There are heavy fights to gain control of the old forts that survived the war of the apostles. Who is going to outmanoeuvre the enemy? Play this quick war game and find out. 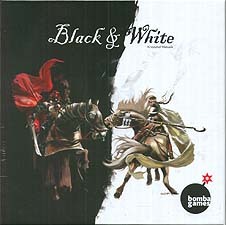 Black & White is a two-player block war game that takes place on a hexagonal board which can be customised by terrain tiles. Before the game, each player builds his army using available troops and choose a leader. Each side of the conflict has nine different units to pick from. The choice is not simple, however, as only a proper balance between infantry, cavalry and artillery will make for a strong army.